Ch. Rajeswara Rao had been suffering from breathing problem and other age-related ailments for some time. Hyderabad: Chennamaneni Rajeswara Rao, a true stalwart in every sense of the word, either in leading the armed struggle against the Nizam in the late 1940s or in Parliamentary form of democracy, breathed his last at the age of 93 in a private hospital in here in the early hours of Monday. Ch. Rajeswara Rao, as he was popularly known, had been suffering from breathing problem and other age-related ailments for some time. He is survived by three daughters and a son —Vemulavada MLA Ch. Ramesh. Rajeswara Rao would be accorded a state funeral, as per the directions of Chief Minister K. Chandrasekhar Rao. The funeral will take place at ‘Mahaprasthanam’ near Filmnagar Colony on Tuesday. A native of Marupaka in Vemulawada mandal of Karimnagar district, Rajeswara Rao has joined the Communist party and participated in the famous Telangana Armed Struggle against the Nizam and had gone underground for some time. He actively participated in the Quit India Movement. Rajeswara Rao was first elected as an MLA in 1957, when general elections were held in Telangana region after the formation of Andhra Pradesh in 1956. He was MLA for six times from Sircilla and Metpally in Karimnagar district and the leader of CPI Legislature Party. Rajeswara Rao continued in CPI after the Communist Party split in 1969. He was senior member in the CPI Central Committee for several years. However, the veteran communist snapped his five-decade-old relation with the CPI in 1999 and joined the Telugu Desam, contested the elections and lost. He went on to win on a TD ticket from Sircilla in 2004, and after completing the five-year term, retired from politics. 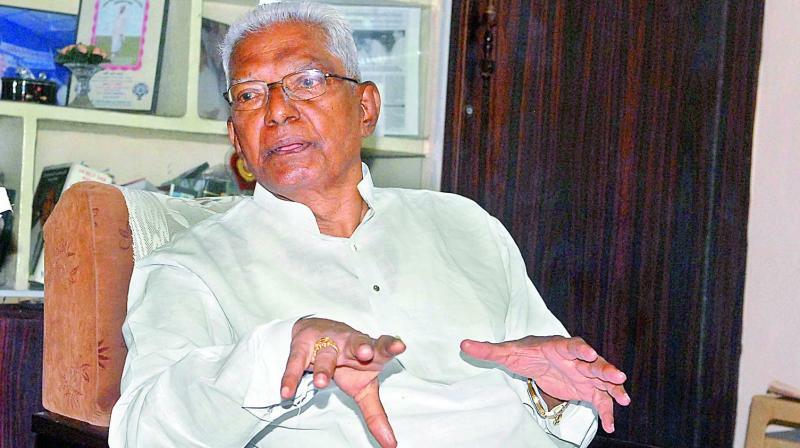 Rajeswara Rao faced widespread criticism for leaving the Communist party and joining the TD, as he had said that the party’s founder-president N.T. Rama Rao should be hanged from the nearest lamppost for ignoring the development of AP. Boinapally Vinod is his nephew. The body of the veteran was shifted from the hospital to his residence in MLA's Colony in Jubilee Hills where several leaders, including the Chief Minister paid rich tributes to the departed leader.